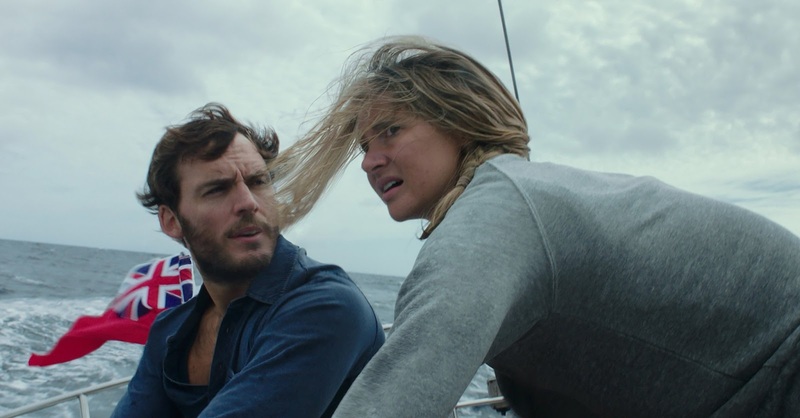 A survival-at-sea adventure drama, Adrift carries an emotional punch and benefits from a terrific Shailene Woodley central performance. The story starts with 23 year old American Tami (Woodley) waking up alone on a stricken and badly damaged yacht, adrift in the wide open ocean. As she struggles to gain control of the yacht and survive, her story is revealed in flashback. It's 1983, and Tami, originally from San Diego, lands in Tahiti as she aimlessly travels the world in search of a purpose. Soon she meets British solo sailor and adventurer Richard Sharp (Sam Claflin). They embark on a whirlwind romance, fall deeply in love, and within months are thinking about marriage. Richard bumps into old acquaintances who ask him to sail their luxury yacht Hazana back to San Diego. Soon Richard and Tami are on their way, but a massive hurricane is in their way. Based on true events as depicted in Tami Oldham's book Red Sky in Mourning, Adrift is part tender romance and part harrowing survival ordeal, the two streams elegantly juxtaposed by director Baltasar Kormákur. The film jumps back and forth between the flashback unfurling the blossoming romance and the present crisis at sea, and the two parts of Tami's story support each other, her perseverance in trying to will herself to survive magnified by having finally found unexpected love literally at the end of the world. After the hurricane Tami's challenge is to tend to her injuries get the boat back to a semi-functional state, try to find and rescue a badly incapacitated Richard, and then develop a plan that could lead to a rescue. She has sailing experience but is no way an expert at navigating the Pacific ocean on her own. While survival movies are common, Kormákur finds enough challenges and opportunities at sea to keep Tami occupied and the narrative humming. The film's greatest asset is Shailene Woodley, and during both the falling-in-love scenes and the terrifying battle against the elements in a crippled yacht, she commands events with a stirring performance full of spirit and determination mixed with self-doubt. Adrift reaches an effective emotional crescendo with a gentle yet potent curve towards the end of Tami's journey. The film leaves its mark as a testament to the human spirit's ability to find reservoirs of strength, wherever they reside, to endure and survive desperate calamities.